Through fundraising, Alex received a Scout Popcorn Scholarship to cover his first year of university tuition. It’s important to familiarize yourself with this year’s product line before you start fundraising. Preparing yourself by knowing what types of popcorn are available makes it easy if people have questions about flavours and options, and it’s also super impressive if you can describe them to your listeners. Sometimes people will ask what kind you recommend, so if you have a favourite flavour, mention that too! When I sold popcorn, I always set goals for myself – usually I set an overall goal for selling more than I had in the previous year, but I also had smaller, more manageable weekly goals. It’s incredibly motivating to achieve these weekly goals, and it can energize you to reach just a little bit further! 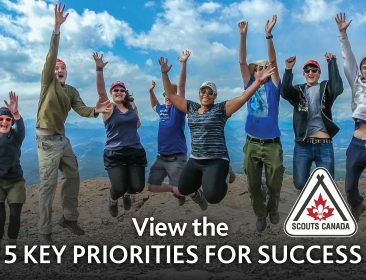 Your goal may be to earn a scholarship and qualify for the Scout Popcorn Adventure Club, or maybe your Group has its own prizes that you’ve got your eye on – whatever the reward, the best way to get there is to set goals and take pride in yourself when you reach them! Sometimes you’ll have off days where you won’t be getting as many orders as you were hoping for. There were some days where I’d visit over twenty houses and every house except for one were either not home, or not interested. That’s okay! It happens – you just have to keep at it, each day is a new opportunity. Above all, safety should be your top priority when fundraising. Whenever you’re out collecting orders in your neighbourhood, always be sure to have someone with you like a fellow Scout or adult you know, and never give out personal information. Ultimately, Scout Popcorn fuels many great adventures. I never imagined I would get the opportunity to experience new things like go dog-sledding, but thanks to Scout Popcorn I did. If there’s an awesome adventure that you want to go on, bring it up with your Scouting peers and Scouters; chances are, there are others who’d love to do that as well, and you can work together to raise enough funds to make those adventures happen!